With only a couple weeks of 2013 left, we've entered that oft harrowing time of year during which we look back and reflect on everything that's happened over the past 12 months: social trends, big news headlines, entertainment highlights and our own personal goals. 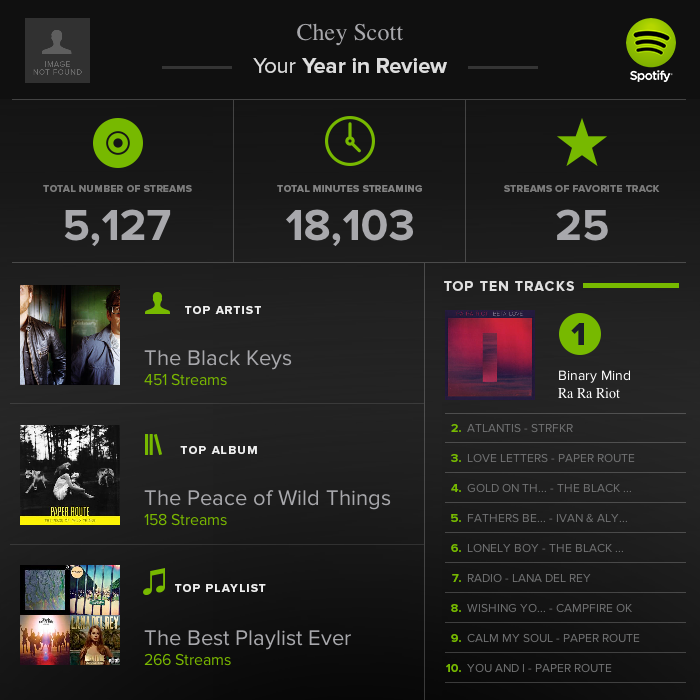 For the many users of Spotify, the popular online music streaming service, now's the time to take a peek back into your year in music with the service's recently released Year in Review feature. The long animated page first features a scroll-through with a bunch of stats, like that 24 million active users streamed more than 4.5 billion hours of music in 2013. Then it moves into the top artists/songs/albums of the year. There aren't many surprises here, but topping the most "most popular" categories (male artist/track/album) is Washington state's own rap/hip-hop duo Macklemore & Ryan Lewis. The review also highlights top plays in different countries and major cities around the world. Getting even more specific, find out what the best "Hangover Cure" song and playlist is, or the best "Guilty Pleasure" and "Workout" songs. How Spotify nailed down these specifics is unclear, but we'd guess it's based on the titles of playlists these songs appear on. Finally, after you scroll through the entire animated page (side note: it was quite glitchy for me in Chrome, but worked okay in Safari) you can login to your Spotify account and find out what your top artists, tracks and playlists for the year were, as well as how many minutes and unique streams of songs you've logged. Here's mine. The page gives you the option to download or share your results via Facebook, but the download doesn't save the file as an image, so if you want to share it with someone via an image attachment or something, save it as .png file. Don't stop there. At the very, very bottom of the page, Spotify tells us that 80 percent of all tracks available to stream have been played at least once. That means the other 20 percent of the service's entire library remains completely undiscovered. Click the play button at the bottom to hear a surprise "undiscovered" play, or just search for the hashtag #undiscovered to find Spotify's official playlist. In other related news, Spotify recently announced it now allows mobile users to steam music for free, whereas up until now users had to be paying subscribers to use the service's mobile app. The one caveat: free subscribers can only listen on a mobile device via shuffle play — no on-demand streams. Also, Led Zeppelin finally agreed to allow their entire music catalog to be streamed via Spotify.